Friday night showdown at Rågsved greenskins versus humans. Planning my army I knew that Nicklas had lots of fast going vehicles with low armour, so many medium hard hitting guns. 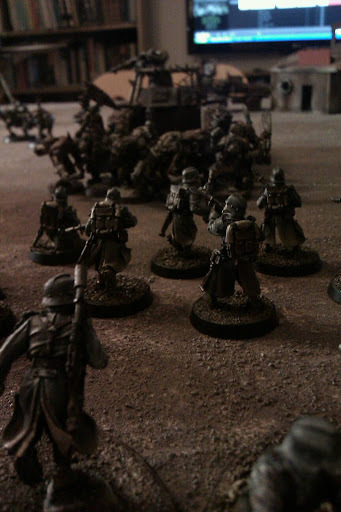 I brought heavy bolters, twinlinked heavy stubbers and one autocannon for my my HQ. We rolled for a mission in battle mission book and all Orcs cheered when an orc mission came up. 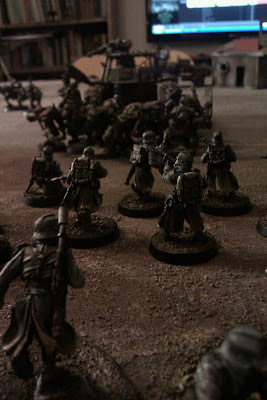 The mission was a kind of killpoints where a troops choice where worth one point the HQ three points and the rest two points. Nicklas was lucky and had the first turn and since thank's to his open top tanks, a first turn assault also brought home the first point. First turn was a big failure for the human since only two orc boys from the ten block were killed. Second turn where much more even and ended four agains four. 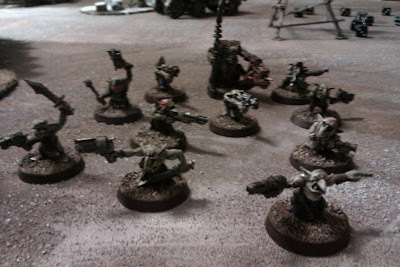 My plan was to have my slow minis like heavy weapons and troops from the begining and keep the fast ones in reserve. So in turn three when my feared hellhound entered the game I thought it would turn the tide. It did well, sadly not well enough. The Orcs where greener and a bit stronger throughout the hole game. But I'm still very proud of my Korps who never gave up and fought to the bitter end. Not even going to ground could save me this day. 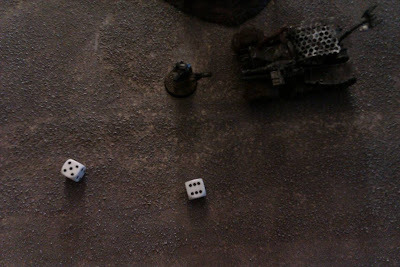 Sometime I realy love games with dice. 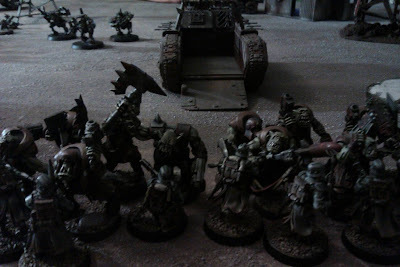 When the Orcs thought that the humans had gave up, a orc nob on a bike attaced my command platoon. Since he had a can opener the command leader attaced first. The power sword cleved the green monsters head in one swipe. The crowed sceamed of joy (like I always do, it's my thing). I did lots of big beginners mistakes but it was a super fun game. I also have to blame the dice, like always. Now I would like to play more. This was super. Yes this was a fantastic game. My orks did well. But as you sade, your humens were brave in to the end. 12 vs 10 is a good game. But we are green you are not.